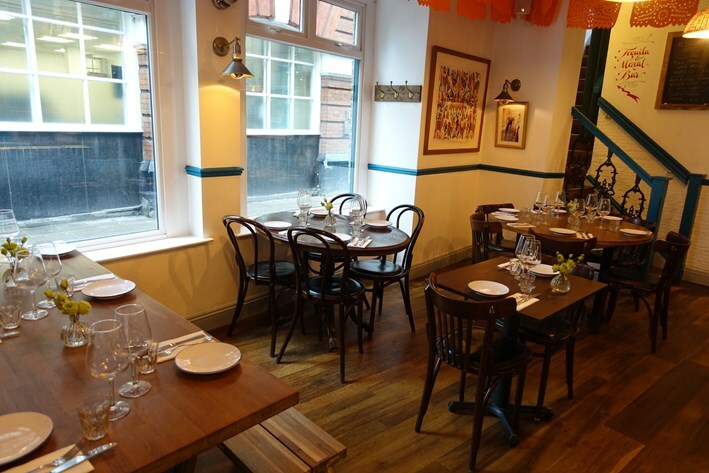 This Mexican restaurant opened in October 2017, though technically this was a re-opening, as it had previously folded in August 2016 after just seven months in business in Shoreditch. 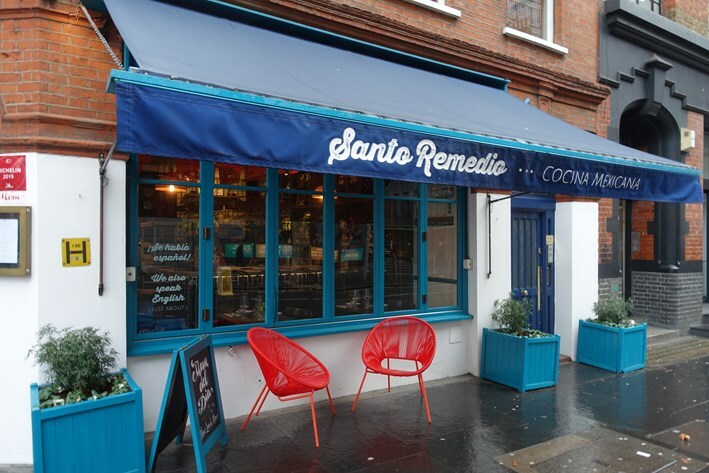 Santo Remedio (“Holy Remedy”) was set up by Edson and Natalie Diaz-Fuentes, who initially ran it as a supper club; Mr Diaz-Fuentes, previously worked for Wahaca. The L shaped dining room has tightly packed tables and unnecessarily loud music that made conversation even at lunch quite tricky. 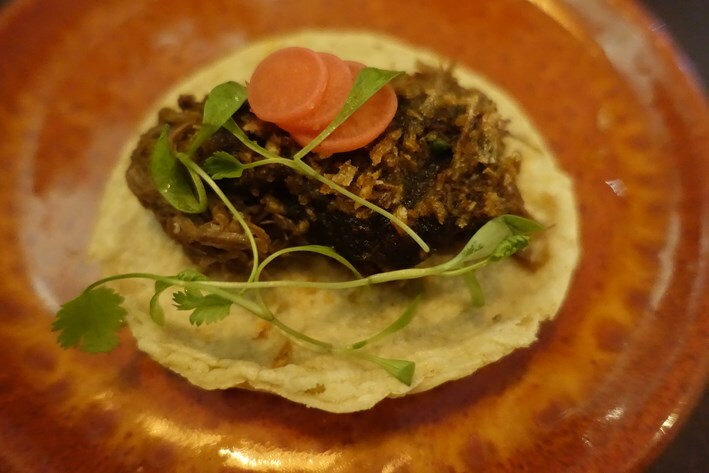 The menu features some familiar Mexican dishes as well as some more exotic fare such as grasshoppers. 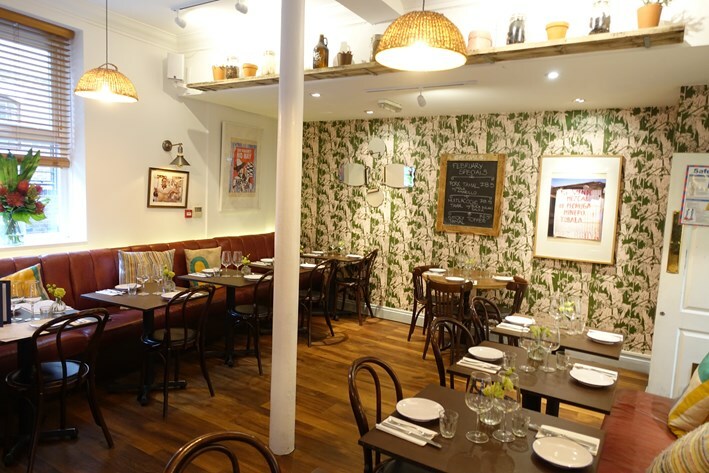 There was a short wine list of 17 labels, ranging in price from £25 to £80, with a median price of £41. Markups varied wildly but average a hefty 3.5 times retail, though the posher wines had kinder levels of markup. Sample references were Marques del Valle Sauvignon Blanc 2017 at £25 for a bottle that you can find in the high street for £12, Alvarez Diez Silga Castilla y Leon 2017 at £32 compared to its retail price of £7, and the excellent Au Bon Climat Chardonnay 2016 at £54 for a bottle that will set you back £20 in a shop. Alternatively there was beer including Pacifico Clara (£5.25 here v £1.25 at Ocado) and Ocho Reales Pilsner from Sierra Madre (£6.50). We took advantage of the cheap lunch menu. 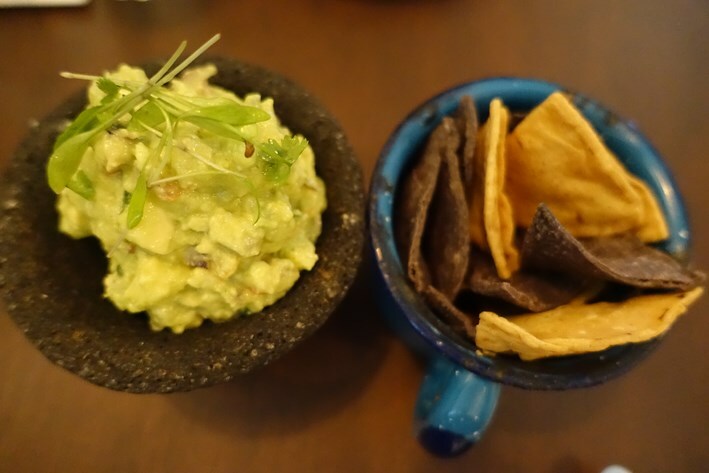 Guacamole with tortilla chips was pleasant, the avocado ripe and there being just enough spicy kick (12/20). Beef tacos had a flour tortilla filled with minced beef. This was decent enough, though the meat was not of particularly high quality (12/20). 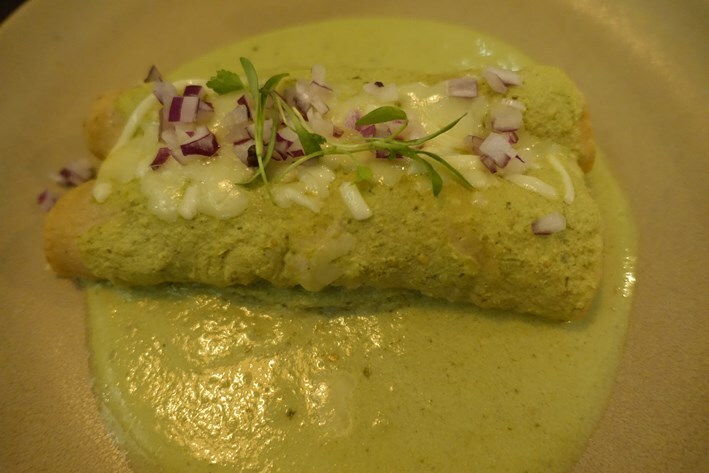 Chicken enchilada suiza was made with tomatillo (a green nightshade resembling a small tomato), and Chihuahua cheese. The tart flavour of the tomatillo was an interesting contrast to the chicken and the spice level was about right – this was the best dish that we tried (13/20). 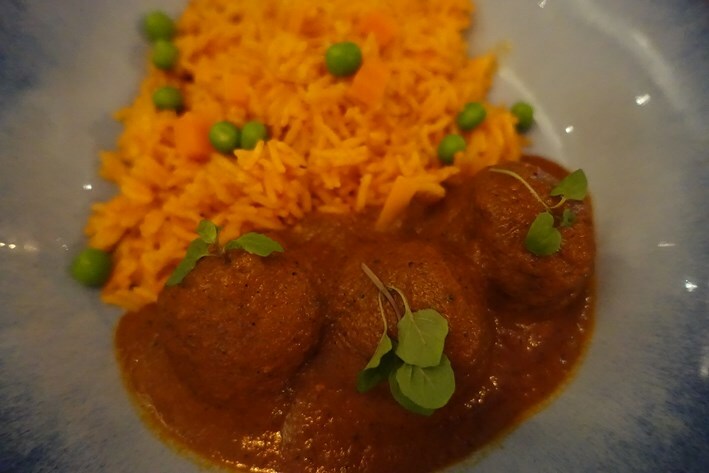 Meatballs in chipotle (a dried, smoked jalapeno pepper) sauce were harmless enough. 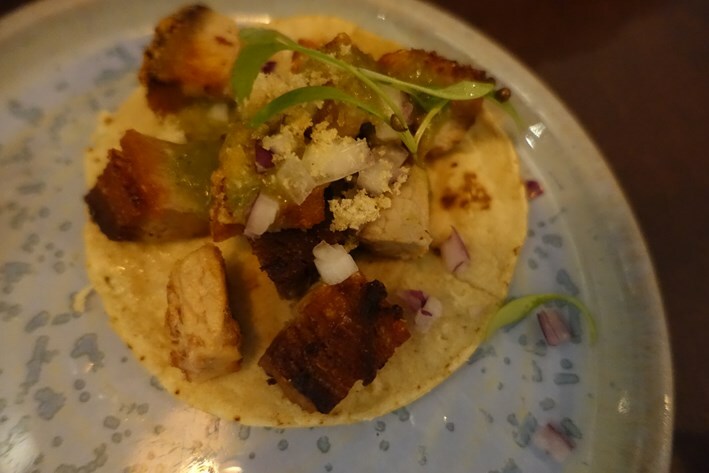 The texture was reasonable and the chipotles brought their gentle spiciness to enliven the meat (12/20). We tried a cactus salad, which had a crisp texture but limited, slightly sharp, flavour (11/20). 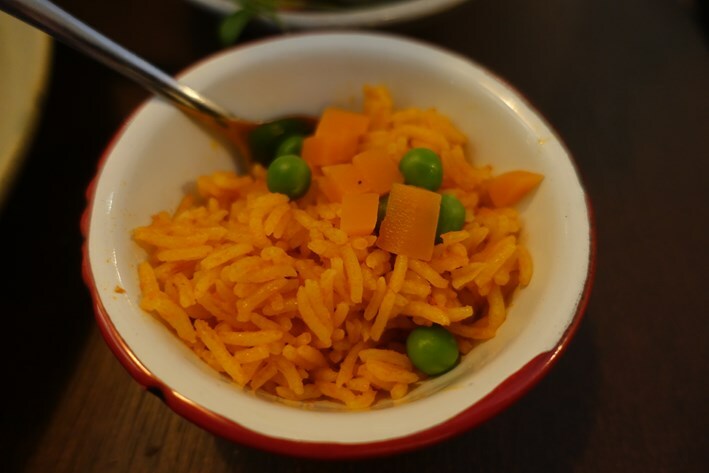 There was also an entertainingly tiny side dish of rice that was dwarfed by the spoon that came with it. It is rice, not caviar, so this portion seemed comically mean. Service was pleasant. 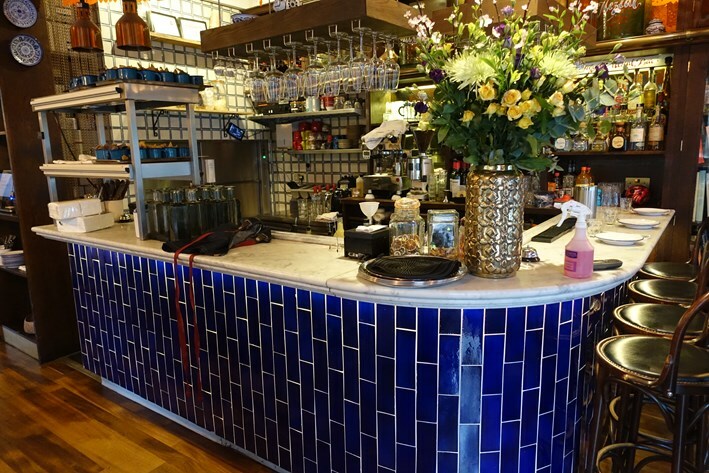 The bill came to £28 per person with for the cheap two course lunch menu and just tap water and coffee to drink. If you ordered three courses and shared a bottle of wine then a more typical cost per head would be around £50. 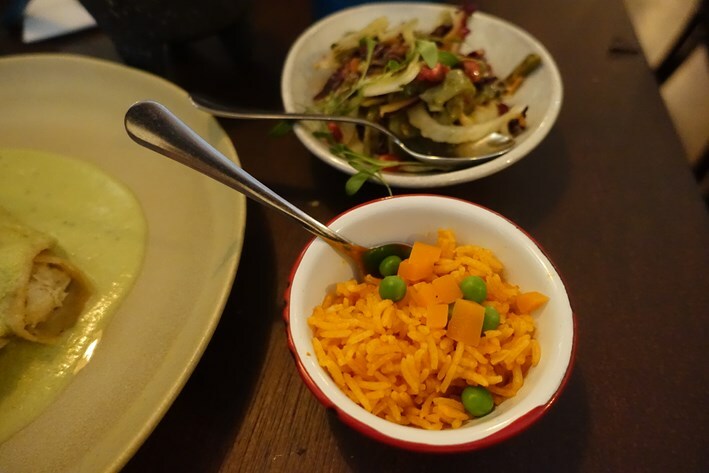 Our meal was pleasant enough, but I am still waiting for a seriously good Mexican restaurant in London. Until it arrives I will have to be satisfied with the odd trip to Punto MX in Madrid.